Nothing like 24 hours in a cramped airplane to create a strong sense of disorientation. That’s how we were delivered in Bangkok at 11:45 p.m. Tired and not sure at all where we were going. Happily most signs had English words below the Thai scripts, and most of the time the translation is accurate or at least close. We were thus able to find our way to the taxi stand line, which took about 25 minutes to snake our way through. 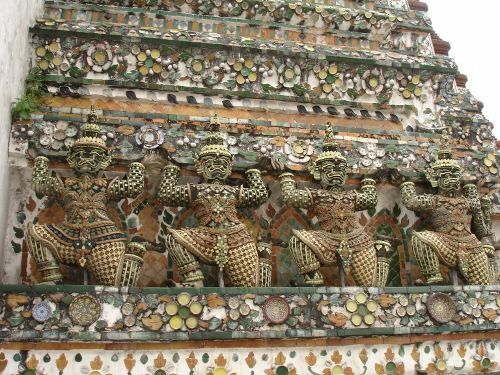 We had heard that Thailand was the “land of 1000 smiles,” and one was readily supplied by our cab driver. He cheerfully explained that the “meter broken” after putting our bags in the back and tucking us in. Ok, so we know better, but we were exhausted and the hotel that we were going to was supposed to be close by. We arrived within 15 minutes, and didn’t find out until the next day that the 9 dollars we paid should have actually been the fare all of way to Bangkok, 35 minutes away. In the words of George Bush, “Fool me once, shame on you, fool me . . . .can’t get fooled again.” Or something like that. The next day we took a taxi to Bangkok and arrived at our hotel. Turns out we were 2 hours early for check-in. Uh-oh. But the hotel did agree to store our bags, and we were then thrust out into the streets of Bangkok without the benefit of a few minutes to gather ourselves in our room and develop a direction and a plan. Still feeling disoriented and jet lagged, clutching a map from the hotel, we picked a direction which we thought was leading us toward the Chao Phray River. When no river appeared, we stopped on the sidewalk to discuss strategy. Along comes another native of the “land of a thousand smiles” deciding somehow that we were people he should get to know. He helpfully asks my husband “Where are you going?” Sean uncharacteristically starts chatting away. (Must have been the jet lag) I, not being so charmed, encourage a parting of ways. Still lost, we turn a corner and happen upon an area map. Luckily, another member of the “land of a thousand smiles” club is there to greet us. She works at the local hospital close by and this happens to be her day off. “Where are you going?” she asks. Just so happens she is also headed toward the river. My husband, who usually has a more suspicious nature, takes to the stranger and chats away with her on the way down the street, me in tow. Are you kidding? We find our way to the “ferry” and she starts assisting us with purchasing tickets. The price, a mere 2000 Baht for the day. About $60 dollars. When we balk, she encourages us to barter (it is Thailand after all). Somewhere through the jet lag fog I recall there is a public ferry, and I couldn’t imagine it would cost that much. We wander off, even more disoriented and now feeling a bit vulnerable. Not a good place. We find a bench by the river and sit to regroup. There is another “boat vendor” close by, but are feeling beaten down and not really wanting to open ourselves up to be taken advantage of yet again. The trip is not starting out well, not so far. We finally summon up enough fortitude to resume our exploration, and find the public ferry. We purchase tickets for 45 Baht for the day — about 5 bucks. 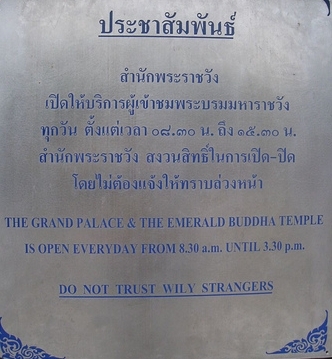 We ended up having a great time and felt we had learned some important lessons that would guide our stay in Bangkok. Sean agreed to stop making “friends” and we now knew to stay away from the most dangerous place in Bangkok – anywhere near a map. Over time we even saw that people had taken to putting up fake municipal maps (matted and hung on a pole). When we heard the words “where are you going” we learned to shake our heads and walk away. We even ignored a friendly smiling Thai who told us that the public boats stopped running at 3:00 p.m. (clearly a ploy to get us on another one of the private 2000 baht boats, not this time sister. Although as it turns out, that was true. Ah well. All of that being said, I have to add that I never felt in danger whatsoever in Thailand. Most of the people were quite respectful and haggling and bartering is done is a very good natured way. Thailand has some absolutely beautiful areas and I woke up every day wondering what I would find around the corner. I was not disappointed and left with experiences that I could not have had anywhere else. I now consider myself a better seasoned traveler looking forward to the next adventure. And visit our Resources Section for money saving tips and our recommendations about ways to travel more comfortably after 2+ years of full-time travel. 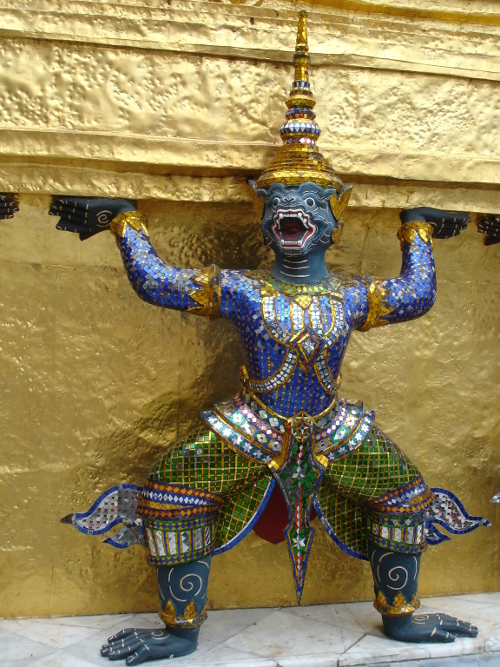 As an expat living in Bangkok, I really enjoyed your account of the first experiences with Bangkok. It’s so true that you eventually develop a reflex mechanism when being approached by vendors where you duck and walk away. I hope you’re enjoying your current adventures.